Thank you for supporting our work by subscribing to our magazine and/or by purchasing individual copies. This is the Printed version our magazine which will be mailed to you. A downloadable pdf file is also available. 1. 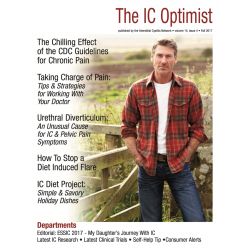 ICN Editorial: “My Uterine Cancer Scare: Hormone Replacement Therapy Carries Risks,” - We begin this issue with very happy news! Editor Jill Osborne is now cancer free and in this editorial she shares the early symptoms that she experienced, four critical mistakes that she made, testing, surgery and recovery. In exchange for help that she received from IC experts around the country, she promised that she would share that experience with patients. She hopes that this will help prevent other IC patients from going through the same trauma that she did. Hormone replacement therapy comes with substantial risks. 2. 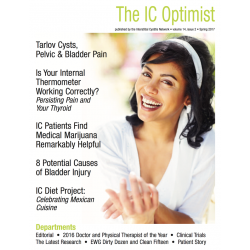 Feature Story: Master Class - “The Broad Picture of Interstitial Cystitis” by Kenneth Peters MD is the educational article we've read in a decade about IC. He explains the clear differences between patients, some with Hunner’s lesions, others with significant pelvic floor dysfunction, how they are diagnosed and treated. 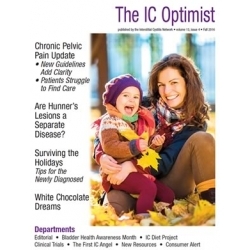 Please share this with your family, your IC support groups and your medical care providers. 3. Clinical Trial Announcements - The global Leadership 301 Study is seeking patients throughout the USA, Canada and in several European countries. 4. Feature Story: Finding Comfort With Pets - Stacey Shannon explores the special love pets offer in times of illness. It’s remarkable how our pets know when we’re not feeling well. They stay close, offer comfort and climb into our laps to offer unconditional hugs and love. My cat Sammy filled my days with laughter, love, and very fond memories. 5. Inside AUA 2017 - The Latest Research - The annual meeting of the American Urology Association featured a lot of new research on IC/BPS. I was most intrigued by the new studies exploring the role of the urinary microbiome. Urine is not sterile. Studies are just beginning to scratch the surface of what a healthy biome is and how that can change in certain diseases. One study found that certain fungi in urine appeared to con- tribute to specific bladder symptoms. I’ve highlighted 19 interesting studies. Fascinating, indeed! 6. 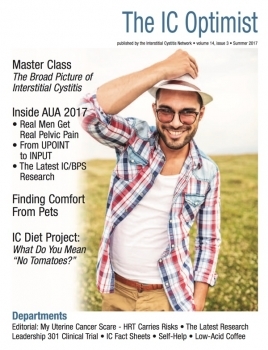 Inside AUA 2017 - Real Men Get Real Pelvic Pain - For the third year in a row, Dr. Jeannette Potts directed the course “Real Men Get Real Pelvic Pain.” She continues the fight for men struggling with chronic pelvic pain who, in years past, have been given years of ineffective antibiotics and prostate medications. 7. Inside AUA 2017 - From UPOINT to INPUT - Another proposed subtyping system for IC/BPS has emerged, an adaptation of the UPOINT system. We receive the three subtyping systems available that can help patients and their physicians find the most important treatments for their specific case of IC/BPS. 8. Self-Help Tip of the Month - How Our Thoughts Can Influence Our Pain Levels - Jill Osborne introduces the concept of Cognitive Behavioral Therapy (CBT). CBT does NOT say nor imply that your pain is not real or all in your head. What it does teach us is that some of our stress and/or thoughts can make pain worse, such as that IC & IBS flare many patients get when they are trying to plan a travel. 9. IC Diet Project - "What Do You Men "No Tomatoes?" Julie Beyer MA, RDN shares some fabulous recipes for pizza and pasta in the latest article from the IC Diet Project! 10. ICN Fact Sheets - We include updated copies of all of our IC Fact Sheets, including a new one on IC Subtypes!